In Crimson Peak and Brooklyn, women have to find the world in order to find their place in it. Guillermo del Toro has pulled off a difficult trick with Crimson Peak: making a movie that detractors claim is too easy to figure out and yet too difficult to categorize. According to Variety, this ghost story—or rather “story with a ghost in it,” as its heroine would say—has disappointed audiences by being “more of a romance than a straight scare machine.” But even as the film’s genre refuses to settle down, the plot, according to critics, confirms expectations to a fault. As A.O. Scott wrote in The New York Times, “it does not take much of a sleuth to discern that some terrible things have happened” in the luxuriously rotting mansion to which Crimson Peak brings its heroine as a virgin bride. Well, terrible things have been happening in the House of Usher since 1839. Is that any reason not to visit? Before the gorgeously perverse Crimson Peak fades from the screen like one of its own wraiths, I want to make a case that this is a movie worth viewing. I might even say it demands to be seen—sight being its dominant motif, and a reluctance to look at the obvious being the engine of its venerable plot. Cast as another strange adventure of Mia Wasikowska, the pale and outwardly fragile actress who has previously shown reserves of inner strength and weirdness for Tim Burton and David Cronenberg, Crimson Peak is the tale of Edith Cushing, a young woman in gaslight-era Buffalo who wears eyeglasses and ignores the amorous glances of a dashing ophthalmologist. Her would-be suitor, Dr. McMichael (Charlie Hunnam), takes an interest in the latest development in optical science: spirit photography. He has recently acquired an entire collection of indisputably authentic glass slides, which he is eager for Edith to view. But she doesn’t need to be convinced that ghosts are real. She can see them with the naked eye and has been doing so since she was a little girl. Visited now and then by the ghost of her cholera-stricken mother, whose intrusions haven’t exactly wrapped the girl in sustaining warmth, and bound perhaps a little too tightly to her wealthy, widowed father, Edith has grown into an aspiring author, who derides the sentimentality of people who would marry her off and disdains the myopia of editors who would limit her, as a woman, to purveying only love stories. Plausibly single-minded in her ambition, thanks to the endowments that del Toro and Wasikowska give her, Edith has a writer’s capacity for focused work (witness the inky thumbprint she absently leaves on her forehead), an appropriate range of reference, and a ready wit. When teased that she’ll die an old maid, like Jane Austen, Edith shoots back that she’d prefer to be Mary Shelley and die as a widow. She has a writer’s eye, too. After being introduced to an English baronet, Thomas Sharpe (Tom Hiddleston), who has come to Buffalo seeking investors for a machine he’s invented, Edith points out to her father that the suit of this sleek aristocrat is beautifully cut but almost threadbare. She means to compliment Thomas on his fortitude; she thinks she may have been too hasty to express American contempt for Europeans born with titles and property. But this seemingly acute observation is actually a sign that desire has at last clouded Edith’s vision. She sees only what pleases her about Thomas, overlooking the shadows that trail him like a cloak. To the audience, the man is clearly on the make—and like Roderick Usher, he’s also manifestly too close to his sister, played by Jessica Chastain with a brunette wig, a facial expression that’s barely warmed to room temperature, and a gait that makes you think she’s got wheels, not feet, under those floor-sweeping velvet gowns. To stroll through the park with Thomas’s sister is to find dozens of butterflies littering the lawn with trembling, dying wings. Yet Edith, blind to the omen, goes on asking about the Sharpe estate, oblivious to the close-up del Toro gives you of ants biting into the butterflies’ eyes. So, after an iris-in effect (even del Toro’s transitions are thematic, contracting the image to a little circle that then blinks shut), Edith does what you know she should not—at which point, you can choose one of two ways to think about the action. You can bore yourself by reducing her experience to a list of paraphrasable events, with so many easily anticipated discoveries and so many unsurprising struggles. Or you can amuse yourself by watching the Sharpe mansion, called Crimson Peak, shift its form around Edith, sometimes seeming to become her killing jar and sometimes her cocoon, as she undergoes the pains of an attempted metamorphosis that is aided by her peculiar visual talents. Without lapsing too far into synopsis, I can tell you there’s more for Edith to see at Crimson Peak than there was in Buffalo, and that this gloomy ancestral pile offers her other expanded possibilities as well. She has gone from the muddy streets of a new American city to a vast, empty plain of mud (red clay, actually), into which the mansion is inexorably sinking. She has left behind her father’s house, with its bourgeois American imitation of baronial magnificence, and entered the full-scale original, encrusted on all sides by the carvings, mementos, and sins of generations of Sharpes but open (through its shattered roof) to a perpetual snowfall. This place suits Edith, despite the plot’s assumption that she’s trapped here, and the visual scheme’s slyly deceptive pretense that she’s the angelic opposite of a diabolical sister-in-law. Edith has the funebrial sensibilities to grow here, even if she’s as white as a conventional ghost by the time she spreads her wings. And Edith can fulfill herself here without giving up her authorial skills. You might go so far as to say that her final act in the movie is to slice away a redundancy. This being a horror movie—more or less—she just happens to do it not with a pen but a shovel. I know that all moviegoers’ eyes will soon be on a different kind of Spectre (unseen by The Nation, by the way, at the time of this writing). I’m as eager for it as anybody. But I think film culture would be much poorer if it looked away from this deliciously mordant work by del Toro, one of the few writer-directors today who don’t just craft images but think in them. Cast a backward glance, if you can, at Crimson Peak as it dissolves into the past, and you might feel a rare frisson of delight mixed with shock—especially when the import of Jessica Chastain’s climactic utterance sinks in. The reason so much horror has been needed, she explains, is that love requires it. While we’re on the subject of young women who leave home, and movies that can offer familiar stories and yet be deeply satisfying, let me recommend the lovely, gentle period drama Brooklyn. Its director, John Crowley, is not someone who thinks in images; but going beyond the efficiency of previous pictures such as Closed Circuit, he now shows he can draw out moods that linger across entire sequences, as a melody is phrased over bar lines, and is willing to give emotional nuances the time and space to breathe within scenes. If I hesitate to call Brooklyn “a film by John Crowley,” it’s not to belittle his artistry but to give credit to other authors who also must be acknowledged: screenwriter Nick Hornby (working from a novel by Colm Tóibín) and actress Saoirse Ronan, who appears in every scene and brings life to them all. A seemingly self-possessed young woman whose crystal blue eyes and porcelain skin can be made to seem eerie, and have been put to that use in films from Atonement to Hanna, Ronan here gives down-to-earth flesh to a thoroughly normal character: Eilis Lacey, whose rural Irish town offers her no future beyond the opportunity to reproduce its present. With muted excitement (because emotional outbursts wouldn’t be proper among her people) and nagging guilt (because she’s leaving behind a widowed mother), Eilis embarks from Cork to the Brooklyn of the early 1950s, where a helpful priest (Jim Broadbent, at his most twinkly and comfortable) has arranged for her working papers, her lodging in the boardinghouse of strict old Mrs. Kehoe (Julie Walters), and a job behind the counter in a department store. The charm of Brooklyn, and its quiet daring, is that it keeps you engaged with Eilis through her slow, undemonstrative months of seeing the world open up, little by little. A man who isn’t Irish—the counterman at Berman’s deli—casually flirts with her when she calls for the check. Night classes in bookkeeping take her to Brooklyn College, where she ventures a few words with strangers. A new girl settles in at the boarding house and makes Eilis feel almost experienced. Then comes the biggest step yet: She attempts a very restrained jitterbug at the parish dance and finds herself being walked home by Tony (Emory Cohen), who nervously confesses, just so she doesn’t think he’s hiding anything, that he’s Italian. Eilis remains close-lipped but resolves to expand her horizons further. She takes instruction at the boardinghouse in the art of eating spaghetti. This is the first half of Brooklyn: a softly lit series of mealtime scenes, shifts behind the department store counter, rides on the streetcar, and conversations conducted with many downward glances, all involving people who are remarkable only for the excellent though undramatic reason that they’re kind and decent. Then, as subtly as Brooklyn has expanded Eilis’s world, it intensifies the drama by making her measure the change. Returning home for a visit, she appreciates her town for the first time as a “calm and gracious” place. How could she have known before? And how could she have discovered, without having left, that a lanky, gentle­manly rugby player (Domhnall Gleeson) could make her feel she might like to stay? A story about having to find the world in order to find one’s place in it, Brooklyn recreates an immigrant experience that is separated from us by 60 years in time, and perhaps an eternity in sensibility, but that feels immediate and true. Of course, if you’re drawn exclusively to stories of today’s Brooklyn, where the immigrants are from utterly different backgrounds and the young people would attend a parish dance only to prove they weren’t ironic, then Brooklyn might seem to be old news. 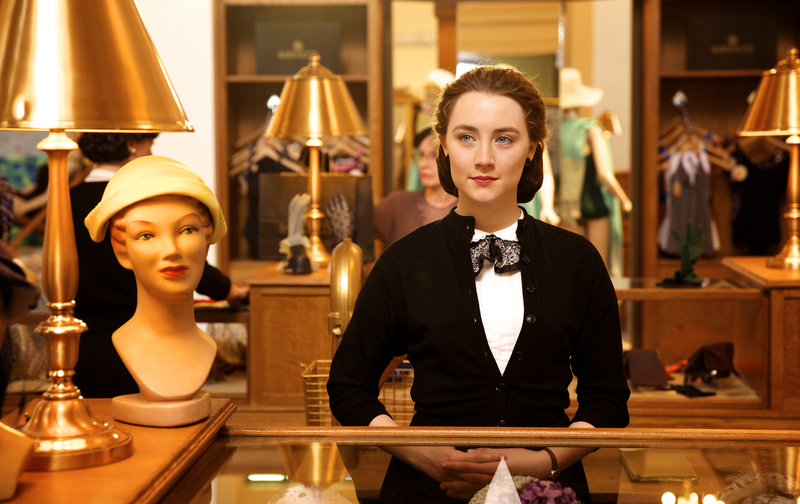 But to me, very little is as fresh as Saoirse Ronan in Brooklyn: an actress whose every thought, whether voiced or silent, seems to register on her skin, playing a woman who mostly keeps her feelings under the surface. Among the other films that November brings are two exceptional political documentaries: one about the years of jockeying and negotiation that led to the adoption of Zimbabwe’s constitution in 2013, the other about the Six-Day War and Israeli efforts to shape its meaning. Both are notable for presenting material that you never would have imagined you’d see, or that (in the case of the Israeli film) had been kept from the public for decades. Democrats, directed by Camilla Nielsson, represents the work of three years for the filmmaker and more than that for her subjects: Paul Mangwana, a high-ranking official in Robert Mugabe’s ZANU-PF party, and Douglas Mwonzora, a human rights lawyer associated with the opposition MDC-T. In the wake of the 2008 power-sharing agreement between Mugabe and Morgan Tsvangirai, these two were appointed co-chairs of the committee charged with polling citizens about their views on government and then writing a constitution. As you see from Nielsson’s footage, Mugabe began by treating the initiative as a farce, and he was still laughing when it ended in 2013. But for Mangwana, a rotund, gap-toothed man whose personality leaps off the screen, the joking stopped around the time he realized he might be murdered—not by the opposition but by members of his own party, who were calling him a “sellout” for speaking with Mwonzora. Given astonishing freedom of access to both men, Nielsson takes you into their negotiations and private moments alike, revealing some of the hidden realities in a society that operates by blatant pretense, and (even better) movingly documenting the change that came over Mangwana. Not only did he draw close to Mwonzora, but he grew to believe in the constitution they were writing together. Censored Voices, directed by Mor Loushy, makes public some of the audiotapes that Amos Oz and Avraham Shapira recorded, only days after the end of the Six-Day War, with young men who had returned from battle. Some of the material from these conversations emerged in Shapira’s oral history The Seventh Day, published in Israel in 1970. The bulk of it was censored by the Israel Defense Forces and has since been withheld by Shapira. Now Loushy has taken excerpts of the censored tapes and combined them with archival footage of the war, commentary by Oz, and present-day images of the speakers listening to their own voices, creating a collage film that serves as a counternarrative to the standard triumphalist account.